My garden didn’t do so well this year, but the one thing that it did produce were potatoes! Plenty of them! I have learned from last year that storing them in our cold dark cellar didn’t do the trick and the potatoes didn’t last very long. So, we have decided to go the freezer route this year. It took us all afternoon to peel, shred or cut, blanch and then freeze, but it was all worth it to indulge into homegrown/homemade hash browns, chips, salads and our favorite mashed potatoes. I have also learned from my past failures of trying to rush the freezing process, that you DO NEED to blanch your veggies. Otherwise, they will be all soggy and you might as well throw them out. Roasted Sweet Potato Salad (Can be made with regular potatoes as well. The cowboys prefer the “regular” potatoes, but they try to please the ranch mom and try new recipe creations). Dressing: 2 tablespoons honey, 2 tablespoons grain mustard (we like the spicy kind), 2 tablespoons of lemon juice, 2 tablespoons of olive oil (try using roasted pepper olive oil from Costco), salt, pepper and cayenne pepper to taste. Peel and cut up your potatoes, toss about 2 tablespoons of olive oil on them and roast at 400 degrees for about 20 – 30 minutes. Sauté your pepper, onion and green onions until translucent. Time to assemble, put the ingredients into a big bowl and mix your dressing. Once the potatoes are done include them into the bowl and pour over the dressing. Your salad can be served warm or cold, but I found that we did like the warm version of the salad much better. We have tried both versions. The dressing does wonders with the warm veggies. Stay tuned for homemade potato chips recipe and tips on how to grow your best crop of potatoes. There is always the possibility of a great and fruitful garden next year, right? 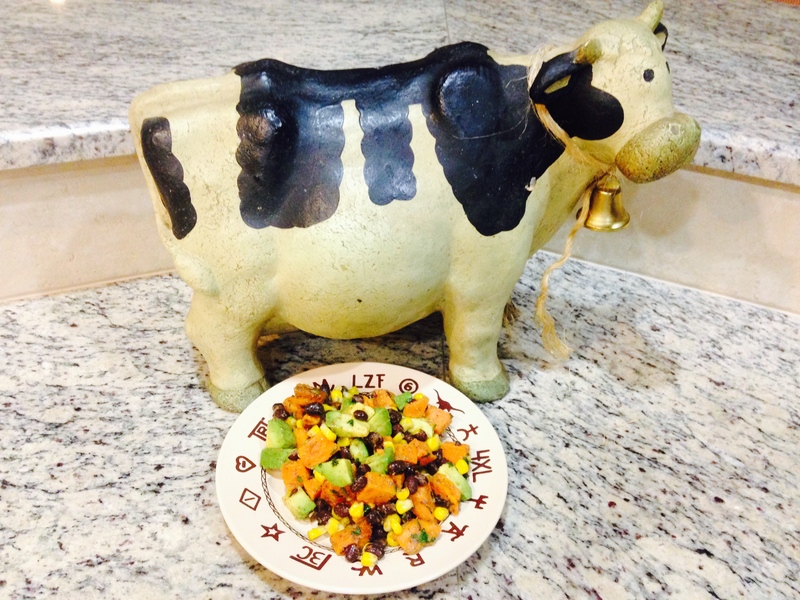 BTW.. 3T Ranch T-Bone steak would be the perfect addition to this salad!